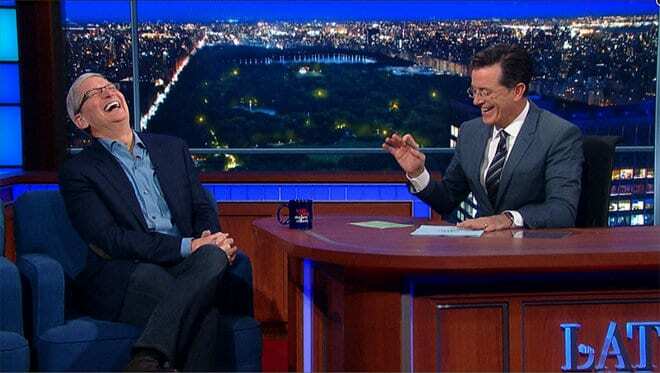 Fresh from presenting the tech giant’s newest line of products last week, Apple CEO Tim Cook made an appearance on The Late Show with Stephen Colbert with the interview covering the new iPhone 6s, the chances of an Apple car, the late Steve Jobs, and even Cook’s personal life. Colbert started the dialogue by pulling out a rose-gold colored iPhone 6s, while telling the audience Apple didn’t give it to him and joking he wasn’t going to give it back. After expressing relief that the charger won’t be changed, Colbert and Cook touched on two of the new iPhone’s features, the first being the 3D Touch, which is highlighted by the Peek and Pop. If I hang up hard enough on someone, will it hit them on the other side? Cook amiably replied that Apple hasn’t gotten there just yet. The Live Photos feature was also demonstrated, with the talk show host presenting a still of himself holding a book entitled, “Slapstick Theory in Practice” – which slaps him in the face during the 1.5 second interval after the photo. Colbert then mentioned last week’s appearance of Uber CEO Travis Kalanick, who mentioned that Apple is working on a driverless car, like Google. He asked Cook about it, who then deflected it with the standard evasive remark implying that Apple is looking into it, though it devotes its resources on a selected few. The Steve I knew was an amazing human being. He’s someone you wanted to do your best for. He invented things I think other people could not, he solved things other people could not. He has this uncanny ability to see around the corner and to describe the future, not an evolutionary future, but a revolutionary future. He was a joy to work with, and I love him dearly and miss him everyday. I think that a lot of people are trying to be opportunistic and I hate this. It’s not a great part of our world. 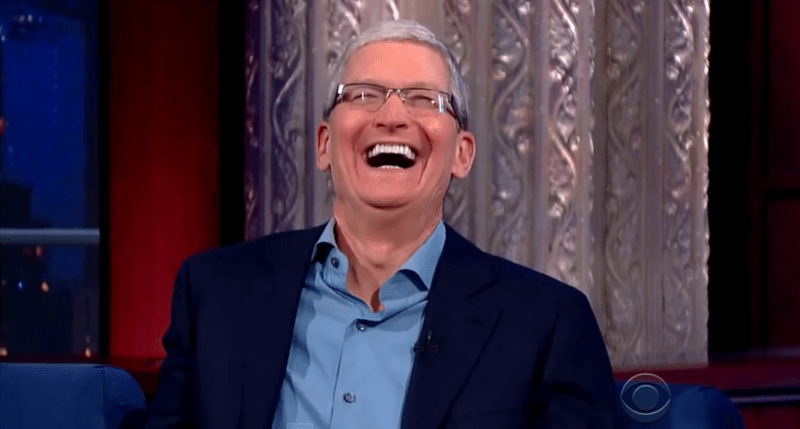 The discussion then turned towards Apple’s charitable efforts and Tim Cook’s sexuality, with Colbert asking about the Apple honcho about him coming out as gay last year. He added jokingly: “Was it an upgrade or a feature that had not been turned on?”, causing Cook and the audience to explode in laughter. Cook recounted a now well-known story of him being inspired by Martin Luther King, Jr.’s quote, “Life’s most persistent and urgent question is ‘What are you doing for others?’ “, which led him to come out. It became clear to me that kids were getting bullied at school, kids were basically being discriminated against, kids were even being disclaimed by their parents, and that I needed to do something. And that where I valued my privacy significantly, I figured I was valuing it too far above what I could do for other people, so I wanted to tell people my truth. He then added that a significant number of people already knew about it, especially those working closely with him. Many people already knew, and to many people it was no revelation. It’s like discovering something in your iPhone – it’s always done but you didn’t quite know it. It wasn’t a revelation to the people I worked with, but it was maybe to the broader world. I felt the tremendous responsibility to do it. With Cook and his commitment to social responsibility at the helm, Colbert asked if this also translates to how the company manufactures its products. Absolutely. In our supply chain, we train everybody on their rights as we see them. We really have a high bar. We bring college classes to our manufacturing plants because we want people to grow and move up their own career ladder. Cook also mentioned that they want to leave the world a better place than how they found it, which is why the company is focusing on education, environment and human rights. Right on cue, she replied: “Do me a favor, ask him when I’m going to get a raise,” to which Cook and the audience replied with uproarious laughter.